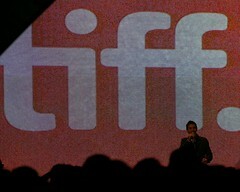 TIFF began in 1976 as the “Festival of Festivals,” where 35,000 Toronto Film enthusiasts watched 127 films from 30 countries. Since then, the festival has grown, last year to 372 films from 72 countries, enjoyed by over 400,000 people. 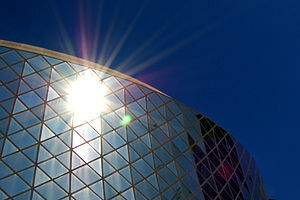 Today, we’re talking a walk in the area, visiting Roy Thomson Hall and checking out St. Andrew’s Church, Canada’s Walk of Fame, The Royal Alex, the CEEB building and Simcoe Park. I’m sure there are buildings we’ll investigate more of, especially in this area of the city. If you didn’t know already, this area is part of the original ten blocks of the city and as a part of the oldest area of Toronto, I’m expecting to see quite a number of blue placards talkin’bout history. Some history I found out today: Roy Thomson Hall opened in 1982, with a circular architectural design and sloping and curvilinear glass exterior that was designed to resemble a container which people were to fill up with their own decorations. Though the original design was supposed to have some pretty awful acoustics it was also designed with absolute accessibility in mind, and after a 22-week long remodeling of the interior, the acoustics have become worthy of the Orchestra Roy Thomson supports. Then it was decided that the seat of government would alternate every four years between Toronto and Quebec. While parliament was in Quebec, the Toronto buildings were used as law courts, a barracks and an asylum for the insane. It was also an early site of the University of Toronto. In 1859, the alternating-capital system was dropped and the government remained at Quebec until in 1865 when Ottawa became the capital of Canada.